The Paso Robles wine region in California is in the middle of a renaissance. Or, rather, the Paso Robles wine tradition is now on the radar of many wine enthusiasts and travelers who are looking outside their normal haunts for authentic wines and locales. The 2014 Wine Tourism Conference will be held in Paso Robles this November 12-14, 2014, and we are enthusiastic to convene in this exciting wine region. The history of the Paso Robles wine region, like many great wine areas in the world, has religious roots. The Franciscan Friars who served at various missions in the area in the late 18th Century are originally responsible for planting grapes for sacramental wine production (although they did make brandy for export, too, and perhaps just a little for personal consumption). These vineyards were abandoned after Mexico secularized the missions in the 1830’s and it wasn’t until the 1850’s that wine production in the area was revitalized and after California’s statehood. Many Europeans arrived in the 1850’s and with vinifera plantings from their home countries, including imported Zinfandel. Zinfandel is the region’s heritage wine grape variety. The Paso Robles AVA is well known for its Zinfandel prowess although Cabernet Sauvignon and other Bordeaux varieties make up 55% of the total planted acreage in the AVA. There are over 40 different varieties produced in the AVA and proprietary, non-traditional blends of Bordeaux, Rhone, Zinfandel and Spanish varieties are also particularly well regarded. Curiously, the genetic origin of “California Zinfandel” has been a bit of a mystery until recently – the Wine Institute reports that the grape used in California Zinfandel probably originated in Croatia. Cheers to this Balkan country for giving us Zin! And thank you Paso Wine for all the great information on your AVA. 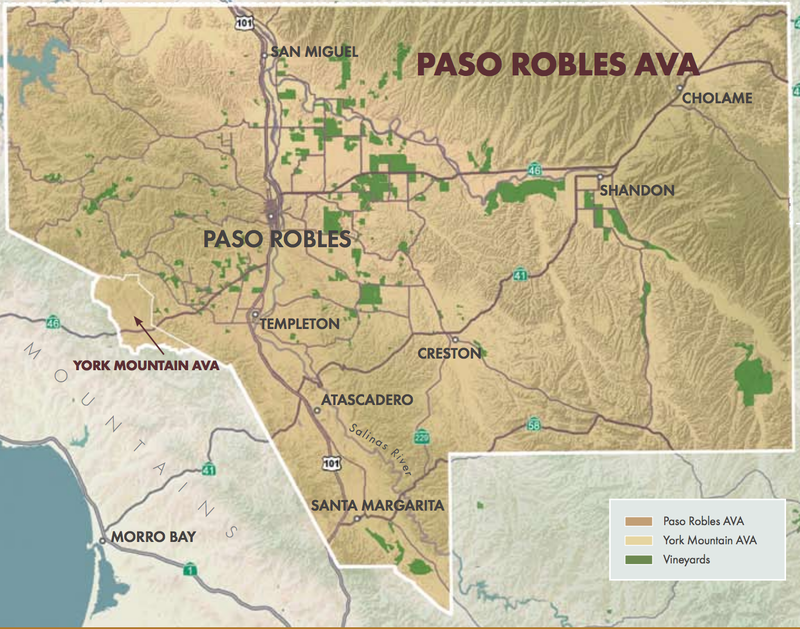 The Paso Robles AVA was officially designated in 1983 with just a handful of charter wineries and 5,000 vineyard acres. Fast-forward to today: it is California’s fastest growing American Viticultural Area, with over 200 licensed and bonded wineries and over 32,000 acres in winegrape production. Because of the maritime influence over the AVA, there is a distinct variation in daytime and nighttime temperatures. This affords fruit maturation during the day and balanced acidity levels at night. Paso Robles itself is just 40 minutes from the ocean and the westernmost boundary of the AVA is just 6 miles from the sea. The AVA roughly forms a rectangle 35 miles from east to west and 25 miles from north to south. It’s proximity to the ocean and the sheer variability contained with the AVA give the Paso Robles wine region the ability to produce a dynamic set of wines and all with their own unique expression. The AVA encompasses 614,000 total acres. Within these confines are: 30 distinct soil series (primarily bedrock derived marine and volcanic from the Miocene Age Monterey Formation), many microclimates, and topography that includes river bottoms, rolling hills, flat lands, and mountains. 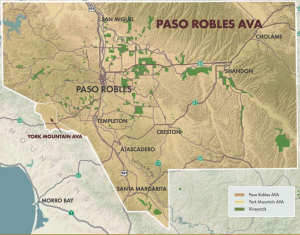 11 sub-AVAs have been proposed for distinction within the Paso Robles AVA; the region awaits final word regarding these proposed sub-AVAs. Experiencing the wines from this region is exciting – so many different styles and varieties! Nestled halfway between San Francisco and Los Angeles along California’s Central Coast, the “City of Oaks” is charming with a population of just 32,000. But don’t let the small-town feel fool you: the wines and wineries are sophisticated, the dining options are hip and delicious, and the region’s more laid-back approach to their wine industry is awesome. We are pumped to host the Wine Tourism Conference in this sizzling, original wine region! Registration for the Wine Tourism Conference is open and we look forward to seeing you in Paso Robles this November.